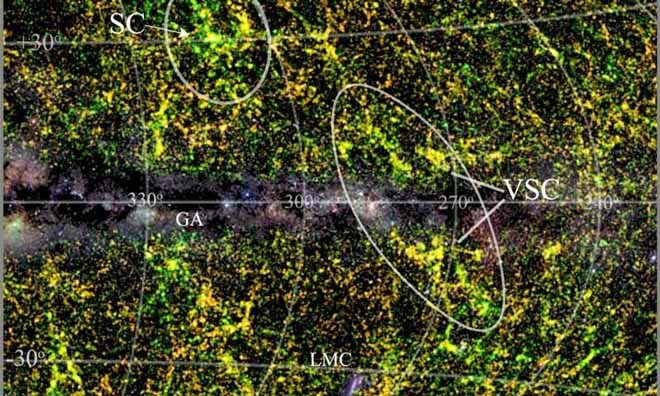 An international team of astronomers has discovered a previously unknown large concentration of galaxies in the constellation Vela, dubbed the Vela supercluster. The gravitational pull from this massive galactic clusters in our cosmic neighborhood may have a significant effect on the motion of the Local group of galaxies, including the milky Way. The discovery also may help to explain the direction and amplitude of the peculiar velocity of the Local group relative to the cosmic microwave background. Galactic superclusters are the largest and most massive structures in the Universe, covering up to 200 million light years. So far, the largest were considered the Shapley supercluster (eng. Shapley Supercluster), located approximately 650 million light years from Earth and contains 25 massive clusters. But recently, an international team of scientists has discovered another huge supercluster a little farther, 800 million light years from Earth, which covers an even greater area of space than Shapley. The supercluster was unnoticed because of its location behind the plane of the milky Way where dust and stars are obscured galaxy, which leads to the formation of wide blurred region. The team’s results suggest that the supercluster Led can be as massive as Shapley. This suggests that its impact on the local volumetric flow is no less great. The discovery is based on spectroscopic observations of several multiobjective with thousands of partly hidden galaxies. Observations in 2012, reconstructed using the South African Large telescope (SALT) confirmed that in the region Led there are eight new clusters. Subsequent spectroscopic observations with the Anglo-Australian telescope (AAT) showed the huge scale of this new structure. Professor rené RAAN-Korteweg of the University of Cape town, who led the study and who has studied this area more than a decade, said could not believe my eyes when, together with colleagues analyzed the spectra of a new survey and saw a significant and visible structure. First, scientists have discovered two massive cluster, and then more distant massive clusters in the immediate vicinity. This space region have been little studied, as the dense star and dust layers interfere with the observations. Scientists hope the new telescope MeerKATM will help them to know the entire size, weight and influence of the supercluster is Led.